This 4-phase program is designed to add 10 additional patients per month to your practice by quadrupling your internal dental marketing response! 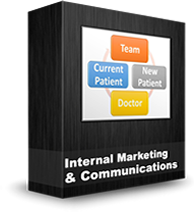 This entire video training tutorial system includes two internal dental marketing video tutorials, pre-written letters to your patients, notes for doctor and team, and more. Plus, we’ll throw in 5 FREE bonuses to boot!